Discussion in 'Audio Hardware' started by Leviethan, Oct 11, 2018. I’m looking for a tube power amp to complement my Parks Audio Budgie tube phono preamp. I’m running it through a Marantz A/V receiver and its just not doing it. Something simple with a couple of inputs (I’d also like to run the analog outs from my Oppo BD player). I’m thinking something under $1000 used, preferrably in the $500-700 range. Not super nice but not garbage. Jolida? bluemooze and octaneTom like this. What are your power needs? I think you'd probably have trouble finding a Primaluna used at around $1000 (and if you do, they may be the lower-powered models). I can recommend the ST-120 by tubes4hifi (Bob Latino) at around $1500 or so new (they will include the tubes you need, or you can build the kit for much less, if you're so inclined). It (conservatively) puts out 6o wpc. I bought a sample model from them (it was shipped with KT88 tubes) about 10 years ago, and it's still going strong. It's not a high-end amp in appearance, but it sounds good, and you can use 6550, KT88, or KT120 tubes with it (I have a quad of KT120 tubes in mine now). These are built on a stereo chassis based on the old Dynaco ST-35 amps. EDIT: I just re-read your post, and you need at least 2 inputs. This wouldn't work for you, I don't think. tubes4hifi can install a volume attenuator, but you won't have the flexibility an integrated tube amp would give you. Upscale Audio is blowing out two PrimaLuna power amplifier's. The 35-watt EL34 based Prologue Four at $1,009 and the 36-watt KT88 based Prologue Five at $1,189*. I bought the Five, I am really impressed with this amp. I have twelve tube amplifiers, and this is top shelf all the way around. It is dead quiet. Check out this video by Kevin Deal from Upscale Audio. "Want the ultimate? Classic Ultralinear all-tube sound, with all the body and glory that you could ask for. For an additional $250 over the EL-34 equipped Prologue Four, you will get an amplifier that has more power, better bass authority, and a little more air on top, but never edgy. The ProLogue Five starts with the same basic topology as the award-winning ProLogue Two integrated amplifier. Further improvements are realized from new driver and phase splitter circuitry. The result is no need for any negative feedback. This means even more natural tonality and better overall musicality. From the Upscale Audio's web site. "Custom designed output transformers Encapsulated low hum, wide bandwidth for great bass and extended highs. Designed by Marcel Croese and one of the most prestigious transformer designers in the USA ." "Plug in virtually any power tube. Adaptive AutoBias will automatically adjust itself! In addition to EL-34s, you can use 6550, KT88, KT90, 6L6GC, KT66, 7581, EL37, and any of their equivalents." *See this link for the sale prices. These amps have only been discontinued in favor for the new Prologue Premium, which is $2,200. Try one and actually see for yourself what 36-WPC of power can do for you! If you need more RCA inputs, just buy an RCA input switch box. trd, djost, bluemooze and 4 others like this. There were some closeout jolidas in the hardware forum not too long ago. I would suggest reading the thread on this site and other forums about the Kingko Audio KA-101... Lots of positive comments, a small company located in Hong Kong. At the current exchange rate, total price is $845 shipped to your door in the U.S. I do not know much about tube amps, but I just bought one of these, primarily because of all the positive comments... I want to compare the sound of a low-wattage tube amp with matching speakers to my 300 wpc ss system. People with more knowledge then myself, pointed out this amp uses el84 tubes, which are cheap, long lasting, and musical. I can't really comment on the sound, because I am still searching for higher efficiency speakers that match this amp better than any pair I currently own. I recommend a new Yaqin MC-13S. New amp and does not need rebuilding that would kill your budget on a used vintage amp. Under $600 from ebay shipped to your house. Change out stock 12AX7s to RCA 12AX7 long black plate and enjoy seriously good sound. Mullard 12AX7 long plate are even better, but expensive tubes. Here is an open box new MC-13S- save $100. I had a Bob Latino ST-120 come across my bench from a customer that stated it was unmusical sounding. I agreed. With capacitor and tube upgrades I could not get the amp sounding great. Never experienced that before. That's a pretty good deal, if the speakers are simpatico. Hmmm. You hear what you hear, I guess. It was what both of us heard, just not myself. Do understand I upgrade tube amps with the best parts and the sound is always far superior to stock amps. Kind of spoilt here plus my customers. Again, you heard what you heard. I disagree that the amp sounds "unmusical", but horses for courses. I've heard amps that I'm not impressed with, that others find very involving, and vice versa. People have heard the Latino amp I have and commented very favorably on it. The Primaluna mentioned above by @SandAndGlass sounds good, and is very well made, but I've also known guys who've heard one or another of that lineup and been unmoved. That's the inherent problem with forum recommendations. 'Problem with forum recommendations'. Sorry, not a great sounding amp in stock form or after upgrades. It is very clear sounding and boring as heard from both of us. My customer sold the Bob Latino amp. You are correct on the efficiency issue. The KingKo EL84 tube amp is too under powered to drive your Chapman T-9 speakers at only 12-watts. I love EL34 based amps, and would like to someday get a KingKo myself. Here is a link to a Dagogo review of the KA-101 by our @Richard Austen. Suggest that you take advantage of the close out on the KT88 based PrimaLuna Prologue Five from Upscale Audio, in my previous post. At 36-Watts, you have three times the available power, which you will need. Otherwise, you may need a mininum of the 100-Watts that can be provided you by a Rogue Cronos Magnum II, with its four KT-120 output tubes. I have high efficiency speakers, so I have used an amp as small as 3.9-Watts from Decware. I have used this PrimaLuna and am currently running it with Zu, Omen Definitions. My other front mains are Polk Audio LSiM707's, which I run with an Emotiva 250-Watt SS amp, which works excellently with them. With my vinatage Altec's, I find that 22-Watts is my sweet spot, I can turn the volume up as high as I would want to with 22-Watts and I have yet to even bother to turn them up all the way. Here is one of my cabinets, with a commercial horn loaded sub next to it. I am currently running the Altec A7's with a Line Magnetic 518iA, which is 22-Watts. I have also run them with a vintage Scott 222C integrated amplifier from the early 60's which uses output tubes that are in the EL84 family and also produced 22-Watts. A7's are not ideal for the average home, but they do come in a Walnut cabinet home version, which has the bass cabinet inverted and the 511B sectoral horn mounted on the inside. 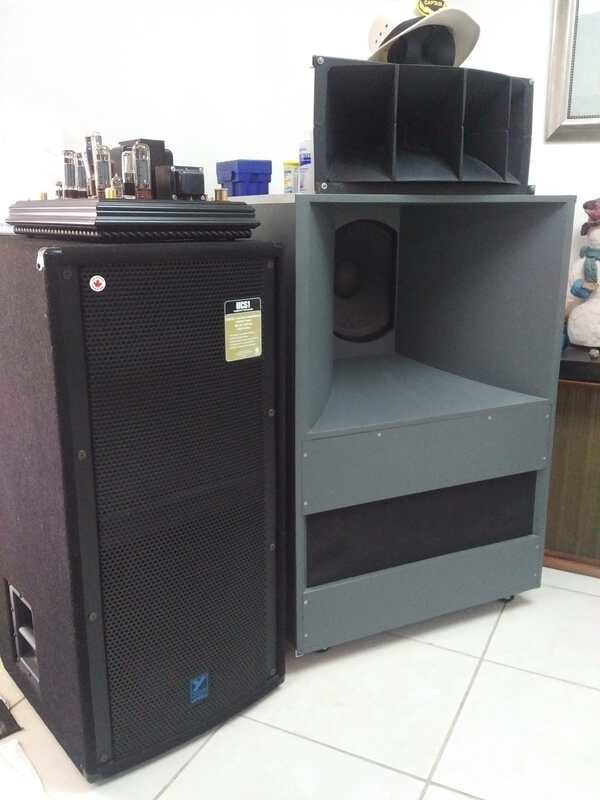 If you are going to go for some really high efficiency speakers, suggest contacting @Warren Jarrett as he is a west coast dealer for Audio Note products. They have an AN-E high efficiency speaker which might work for you. Here is a link to a 2008 Stereophile Review. Here is a 2006 Review from Dagago. We have a member @Richard Austen who is on Hong Kong and is also familiar with Audio Note products (and he also writes reviews for Dagago). Avant Garde in Germany also makes highly efficient horn speakers. Member @Otlset owns a pair of them, if you would like to contact him. I know that some members Otlest and others prefer to run high efficient speakers with OTL type amplifier's. Audio Note makes on of them. Other's like myself use SET type amplifiers, Like my Line Magnetic 518iA. Ezd, bluemooze and Otlset like this. Again, that's fine. It's your opinion, and I hope the customer found something more to his taste. I state I've had several folks really like the amp in question, you state that you and a customer found it boring "as heard from both of us". As the contemporary cliche goes, "sorry/not sorry" if my experience doesn't jibe with your experience with the product. That different ears hear differently, and that the sound of a particular bit of equipment may or may not line up with individual sonic preferences is a fact with any forum recommendations (that goes for any online recommendation) - don't take it personally. thxphotog and timind like this. It's been his MO ever since joining here. The "What I think is fact" way of addressing everything gets old fast and I got tired of attempting to explain how his tastes might not be to others' liking. 2 people not liking an amp doesn't mean anything. Could be the rest of the chain, the room, or just the tastes of the people involved. But I wouldn't suggest you spend any more time on this. Just a suggestion. HiFi Guy, thxphotog, Trabik and 2 others like this. 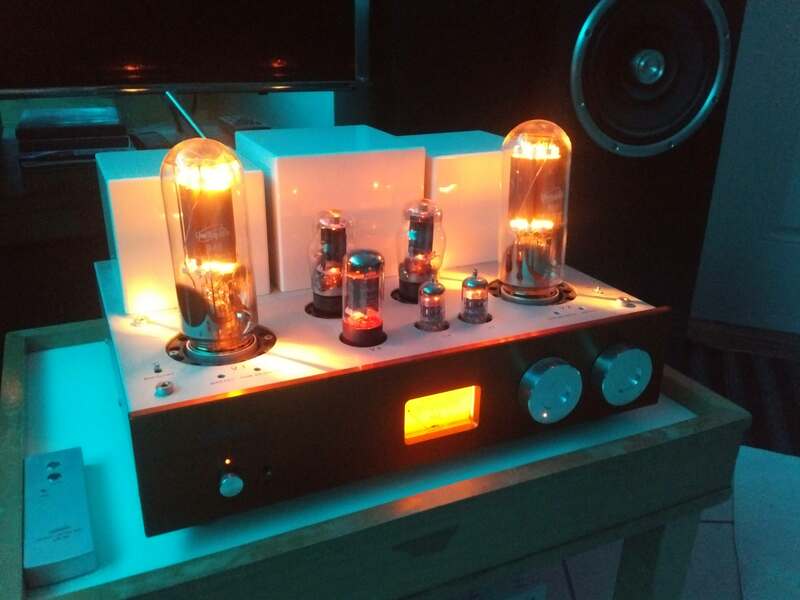 What do you hope to accomplish with a tube amp? I ask because not all tube amps give you that "tube" sound people seem to love. I've owned a few tube amps now and only a couple have given me that sound. Most of them, the Prima Luna Four in particular sounded like a generic solid state amp in my system. It wasn't bad, just not very tubey. I also owned an older Jolida amp, model escapes me, and it also struck me as sort of ho hum so I sold it. My advice is figure out exactly what you hope to gain with a tube amp before buying. Here is a link to a short forum thread on EL84 amplifier's. Ezd, bluemooze and timind like this. So you want an integrated amp and not a power amp? I will suggest that you either save a bit more for a well built tube amp or simply look for alternative ways to improve your system. A good tube amp costs a fair amount of money. A power amp in general is also the last place to spend money on a well functioning system. My guess is that the weak sonic link in your system (assuming the speakers are fine or are staying the course) is the preamp section of the Marantz AVR. You can get better sound by replacing that with a high quality stereo preamp. Again, this will not be cheap, but it will be better if you save and get a nice one. Either solid state or tube is fine. I typically like a tube linestage myself, but really high quality SS can be as good. The one you choose will need to have a HT passthrough feature if you plan on using it with a HT system. All of the new Rogue Audio preamp models have that feature. Most have a nice, built-in phono stage as well. I think trying to shoehorn a stereo input into a multi-channel system without corrupting the stereo signal is a newer function being addressed by manufacturers, so you may not find too many older examples. trd, jdsher, BrentB and 2 others like this. Back to @Leviethan - the Budgie doesn't have a volume control, does it? It's strictly a phono preamplifier, is that right? As @captwillard asks, it seems you actually need an integrated amp, not just a straight power amplifier. I don't know, I have the Five and eleven other tube amplifier's which sound "tubey" to me. By that I mean honest natural tube sound not some bloated, heavily rolled off sound. Modern tube amps with large power tube types, simply do not sound like vintage tube amplifier's do. It you want that vintage tube sound, then buy a vintage tube amplifier. Also, how much tube sound is going to bring to the table is highly dependent of the speakers being used. Vintage speakers will sound nice with tube amplification, as will highly efficient speakers, such as horn driven types. With most ordinary speakers with ordinary efficiency, that are usually driven with tube amplifier's, probably won't benefit that much, if at all from using tube amplification. Nice tube sound can be had using amplifier's which run with small EL84 type tubes. Larger power amplifier's like the big Rogue's are not so tube like as the smaller amplifier's usually are. They do usually take off that SS edge and make thing more pleasant sounding. HiFi Guy and ghost rider like this. no dude, everyone knows its all about $20 Russian capacitors. Source, speakers and room means nothing. HiFi Guy and Strat-Mangler like this. Don't forget he has tons of customers, too. I always seek out those who only have a universal "one size fits all" view on as subjective a thing as sound, too. juno6000, BrentB, Benzion and 1 other person like this. You can get a used Eastern Electric M88 for about this price used. I'm not alone in thinking it is one of the better budget tube amps out there.